a scheduled trip brought be back to yosemite for a few days of hiking and photos. the weather was much different than the previous trip. There was hardly a cloud to be found. while clear skies are great for most vacations, photographers like an interesting sky... something that can make an iconic place like yosemite even more special. reviewing the photos i took, it occurred to me that black and white really fits yosemite, especially at this time of year. there isn't a lot of color. the granite is grey, the trees are bare, the grasses are dormant. 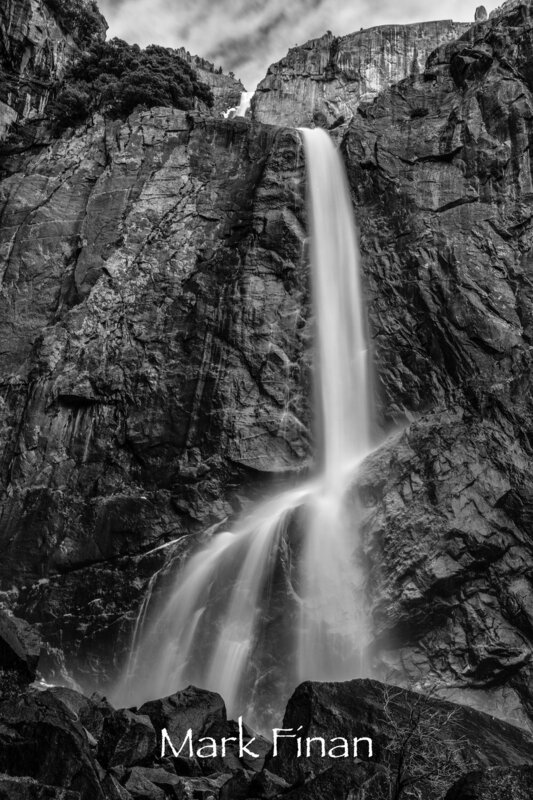 there is also the influence of the classic ansel adams photos that sets a tone there too. lower yosemite falls is a good example. i first finished that photo and posted it on facebook in color. i later processed it in black and white and I like this version much more. the contrast is better. there is something about the rough shapes in the cliff wall and the smooth flowing water. death valley always seemed like an intriguing place.... so vast and sparse.... it sprawls over 5000 square miles. it is known for the heat in summer and having parts of it below sea level. but there are mountains in the park and during my brief visit, I had rain, snow, hail and wind. the temperatures never got warmer than the 70s. I decided to explore 2 areas of the park that can be difficult to get to unless you have 4 wheel drive and patience. my first stop was the eureka dunes located in the north end of the park. they are the highest dunes in california reaching more than 700 feet above the valley floor. I arrived in the late afternoon and hoped to find the shadows on the dunes giving some unique shapes and textures. I was not disappointed. the only problem was wind... lots of wind and blowing sand. I spent about 90 minutes on the dunes and probably still have sand in my ears. blowing sand is not an ideal environment to shoot photographs. keeping your gear clean is a huge concern and shifting sand makes it difficult to keep a stable tripod. I increased ISO a little trying to keep shutter speeds high enough to compensate for any movement. the yosemite valley only gets snow a few times a year. some years more than others. when it snows, you have to go! I have a bit of an advantage knowing when the valley will get snow but knowledge and opportunity are two different things sometimes. if it snows in the middle of the week, i can't get there. my monday-friday job is still my first priority. a nice cold system developed on february 28-march 1 and it was going to bring waves of snow down below 4000' (the valley floor sits at 4000'). i knew this might be my only opportunity this season to shoot yosemite covered in a blanket of white. i left work after the late news on friday and drove 4 hours to the park. it was snowing all the way from mariposa to the valley. driving around the park at 4am in the snow was a beautiful experience. there were only a few people out and most of them were driving plows. there was a night shot that i had in mind and was so happy it worked out. 'yosemite chapel' is the final product. some have commented that i was lucky that there are no footprints on the path the the chapel... well that's an advantage of shooting at 4am! the details of that photo: Nikon D850 iso 1000 24mm f5.6 13 seconds. saturday was a mostly cloudy day and most of the photos that ill post from that day will be black and white. sunday was brilliant blue and those will be color. yosemite has so much to offer all year but winter is my favorite. i hope you enjoy the photos.